This was originally posted by Dave Albert http://dave.is/businesspeople.html I am totally re-posting it but he deserves all of the credit. I just so happen to agree with him and added a few more comments at the end. So you have an idea for a start up? Awesome! The world needs more people like you. You’re going to have to start by finding a technical co-founder. This is hard because you’re not a programmer, so I’m going to teach you how to do it. You’ll notice I said “technical co-founder” and not “developer.” That’s important. If you decide to pay someone a few thousand dollars for a web app made to your specifications, you will probably fail. Why? Because your idea is not very good yet. You’re going to have to iterate a whole bunch of times before your idea succeeds. You need someone who’s going to be in it for a long haul. You need a technical co-founder. This is the third interview that I have had with Dave Olson of HootSuite. 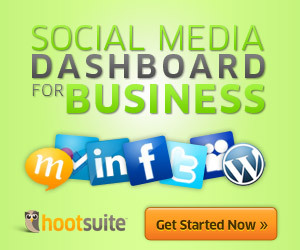 HootSuite happens to be the largest and fastest growing Social Media integrator and management software around. It is the one I use for myself and for my clients as well. We talk about what it is like to be doing what they are doing, how they got there, and where they are going. If you are not using it, I suggest you go sign up for it right now. They have a Free version that is great, plus several other paid versions and stupidly low prices. Click here or on the graphic below to get a free 30 day trial on all of their services. As a client, it is the best Social Media tool that I know of by far. As I found out, they just blew through 3 million users. Holy Smokes batman! Here is the audio and the rest of the interview and if you have heard my interview style before, then you know all about the Umms. Dave O rips it up in this one! Click here to download interview as an mp3. PS Transcription provided by YakWrite.com Transcription services (great prices on interview transcriptions). That 85% of consumers check online before they buy? Over 1 Billion local searches are performed every single month and this number is increasing at about 5% per month? 98% of all searches choose a business on the first page of the search? That the vast majority of the 2% of the searches that continue past the first page choose a business from the second page? So basically, if you are not on the first two pages of the search, you are toast when it comes to local search. The Buck Starts Here ! Welcome to my new site! I know you have literally millions of choices out there and so thanks for stopping by. While I am a decade plus long veteran of the Web, this is the first time I am going to implement and share everything that I have learned over the years from the school of hard knocks and from a lot of trial and error and mostly a ton of research of what does and does not work for myself, my businesses, and with my clients. I promise to not pull any punches and give you the highest level information so that you can add not just a small amount of profits to your game, but to multiply them many times.